I hate to start my Friday morning by reporting bad news, but that's exactly what's coming out of Chesnee, South Carolina, where 50 Studebakers and several other classic cars were obliterated when a garage caught fire earlier this week. 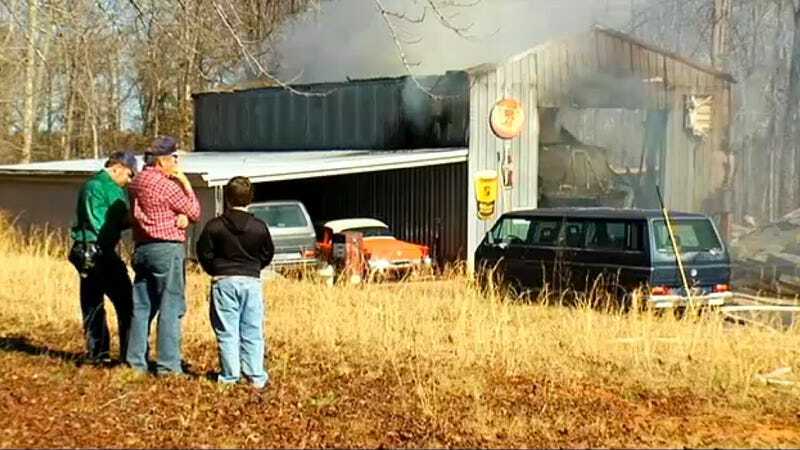 FOX Carolina reports that the owner of a classic car shop was working on one car when its catalytic converter overheated and caused some leaves to catch fire. The blaze spread to the rest of the building, eventually causing part of it to collapse. Some 50 firefighters were involved in putting it out. The fire (which curiously occurred at 417 Studebaker Road in Chesnee) also claimed 20 motorcycles, a camper and a tour bus. No word on whether the owner was insured or not, but his son told the local news that he has other garages full of Studebakers elsewhere. On the plus side, no one was injured. But it's an incredible shame to see some of America's greatest cars go out like this.